The Fox Session Table is 35% larger than our popular Bivvy Table, offering plenty of work and storage space for the angler who fishes long sessions with lots of kit. 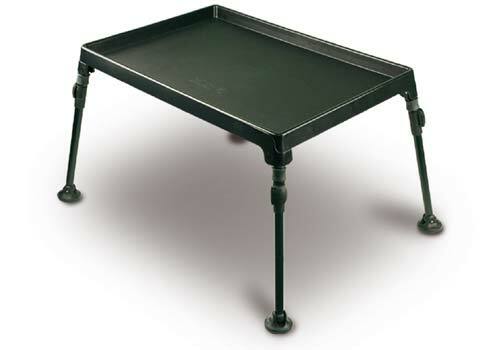 The Session Table is designed to provide storage and accessibility for frequently used tackle items. It allows the angler to be organised and uncluttered by keeping things such as tackle box, phone, car keys and tea mugs off the ground and close to hand. The surface of the Session Table features a special coating which eliminates slippage and provides a sturdy and safe surface for placing hot drinks etc. The legs fold up neatly for storage and feature cam locking extensions with large swivel feet.